Dakota – Outdoor Senior Session. Here is Part Two of the session with Dakota. We spent a good deal of time wandering around the beautiful landscape – perfect photography weather. Yes, these should all have been posted before now, some other events took over that got in the way. They were however posted by my beautiful model on her own pages. This was certainly an unusual situation. I was fresh out of a major surgery, one week to the day, all stapled up, with a drain tube in my side. 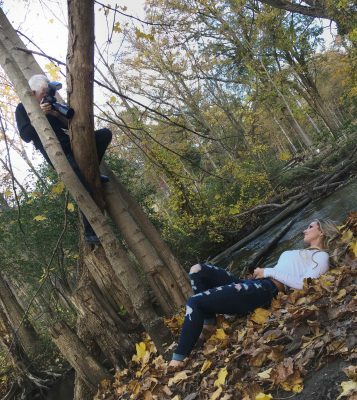 I posted perviously a shot of my in a tree, trying to get a good viewpoint. Dakota’s mom yelled at me when she realized my condition! well, let’s throw that shot in too! The second to last image was the result of that. The truth is, despite the physical limitations at that point, I was having a blast. Dakota and her parents were so cool, and so willing to get into all sorts of situations to get the shots. It was awesome! So dad was employed as a reflector and light holder, a handy thing to have on a shoot. Anyway, enough rambling by me, let’s look at the results. Part One can be viewed here.